Ireland - A great combination of scenic beauty with its rolling green countryside and spectacular coastlines. After having the opportunity to visit Ireland through three separate ports on a British Isles cruise last year, it left us wanting more of this beautiful land and its friendly people. For this visit we decided to stay in Dublin to explore the city and we also allowed for a couple of tours to take in some of the spectacular coastlines. The one main factor that has to be expected and accounted for when visiting Ireland is the rain. The climate is quite temperate with no great temperature swings and lots of moisture that keeps the countryside very green. The weather is quite changeable with little notice and the rain can come and go quickly, so always be prepared. The use of a backpack allows you to keep a sweater, rain jacket and umbrella always available when out and about. Be sure to allow for rain protection for your camera gear also and expect that you will be forced to capture some of your images while it is raining or you may miss the opportunity. In these situations, frequently check your lens / filter glass to ensure no water drops are present that may spoil your images. Carry a micro fiber cloth in an easy to access location to help deal with this situation and always ensure you are using a lens hood to help shelter the glass. Photography done in the rain can produce some interesting images and also emphasize colour. But for when the sun does comes out, don't forget to pack the polarizer filter to help deal with haze, glare/reflections and to get the best out of your skies and colours. Enough about the weather! As I recommend in most cities, the "hop on hop off bus” allows for a great way to get about town while being educated on the city and exposed to the major tourist attractions. 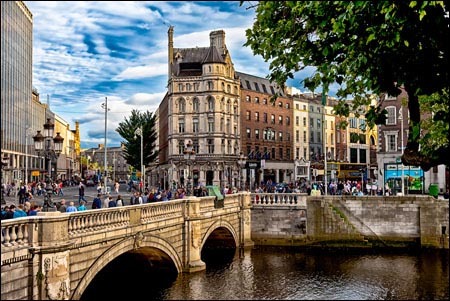 Dublin is no exception and places like the Guinness Storehouse, Jamison's Distillery, Christ Church Cathedral, St. Patrick's Cathedral, Trinity Collage and the Book of Kells to name a few are all available as stops on the one and one half hour round trip double-decker bus ride. One place not to miss and enjoy is the oldest pub in Ireland, the Brazen Head that dates back to 1198. 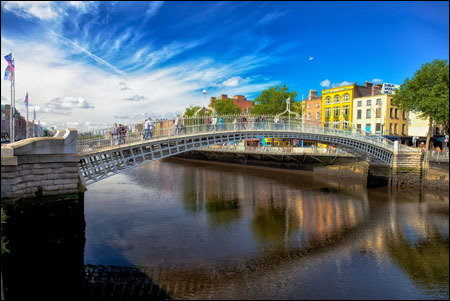 The Liffey River flows through the center of Dublin on it's way out to the Irish Sea and has a number of bridges that cross it including the Ha'penny Bridge that got its name from the old toll that used to be charged years ago. The Vikings originally inhabited the area of high ground near Christ Church and used the Liffey to moor their ships for protection from the sea. 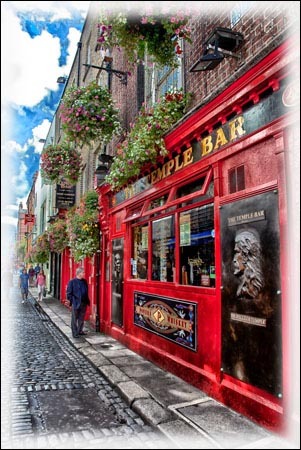 Just off the Liffey on the south side, the Temple Bar area offers a busy nightlife with it's many pubs and live music. The old cobblestone streets, charming and colorful pubs with their lush hanging baskets of flowers add to the overall allure of this part of town. Day trip excursions using a combination of train and coach can take you into places like the Antrim Coast in Northern Ireland and the Cliffs of Moher in the southwest. The train system is quite extensive and offers up light food and washroom facilities. When traveling through the Irish countryside, you get to enjoy the small towns and endless green fields of cows and sheep. 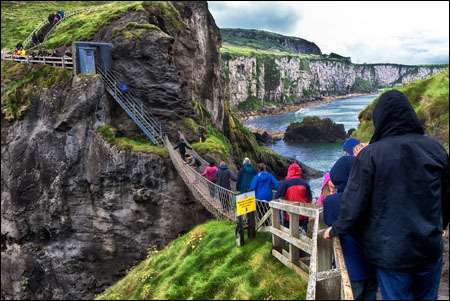 The Antrim coast is beautiful and a couple of the main tourist attractions include the Giant's Causeway with it’s incredible basalt columns formed about 60 million years ago and the spectacular Carrick-a-rede rope bridge. The bridge is a definite must do experience and includes some gorgeous scenic views waiting to be captured by your lens. The original bridge was built by the local fishermen, to help them access the salmon off the island. Some of the most beautiful sea cliffs in the world (214 meters at their highest) can be found at the Cliffs of Moher on the southwest coast of Ireland. These spectacular cliffs are the home to many seabirds including puffins and also include O’brien’s Tower, built to add a higher vantage point to enjoy the views over the cliffs. 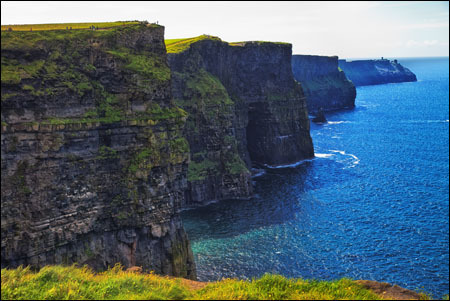 The Cliffs of Moher are one of the biggest tourist attractions in Ireland with more than one million tourists per year. This can be a place where a polarizer filter can help out with the haze and glare that can potentially impact your images. So if you like beautiful scenic green views, drinking stout with a beef and Guinness pot pie and don't mind getting a little wet ... Ireland might be the place for you to visit. A land where the sheep outnumber the people! Larger sizes of these photos and a further selection taken on Ian's trip are in the Gallery of Better Photographs. 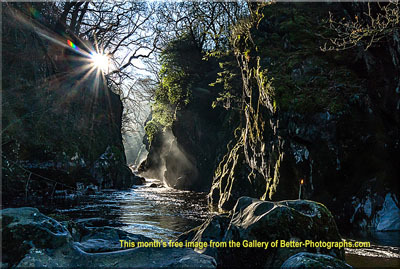 More of his work is on his Website at - Ian C Whitworth Photography. "Ireland has a great combination of scenic beauty with its rolling green countryside and spectacular coastlines. It also has excellent historic architecture with the many castles, churches and of course, pubs." The summer time is a good time to visit with the mild temperatures, while it is said that April is the driest month followed by June. Return to the Places to Photograph page.